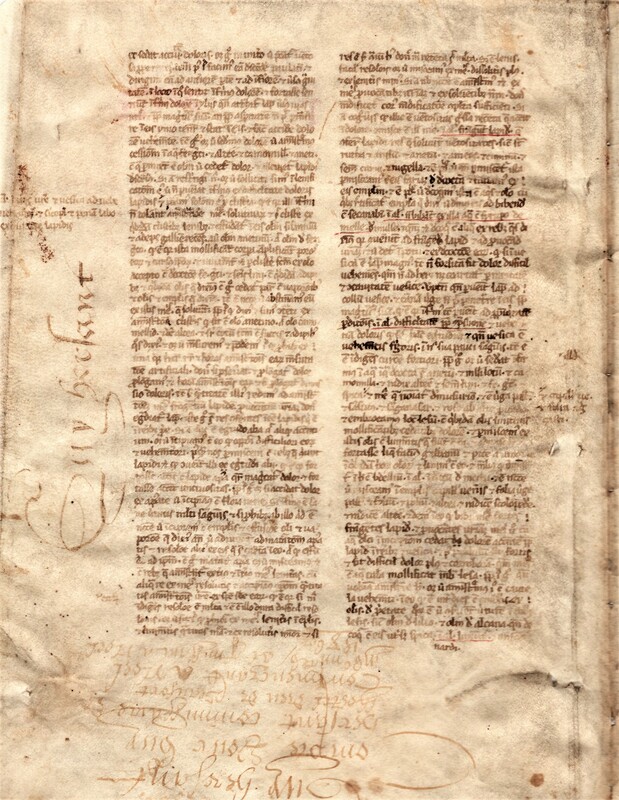 Gerard of Cremona, Practica Iohannis Serapionis, a Latin translation of Serapion’s seven tractates on medicine. Inverted bifolium on vellum. Southern France (?Montpellier) or northern Italy, ca. 1300: each leaf, 305 mm x 218 mm (justification, 190 mm x 128 mm). Double column, 49 lines. Decoration: four two-line Lombard initials in red with very faint contrasting penwork; red capitula marks; quotations underlined in red. Instructions to rubricator survive in the extreme upper margin. 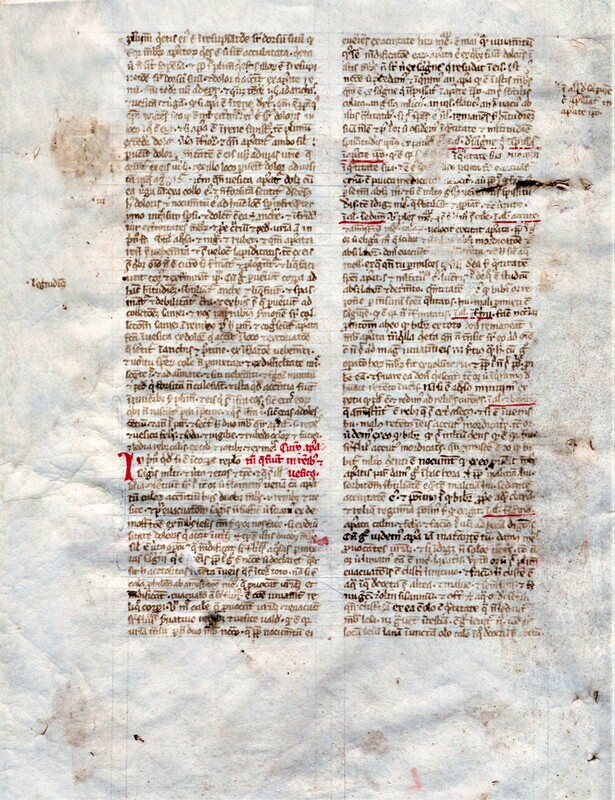 Omitted text has been entered in the margins. Text: the ninth-century Nestorian physician Serapion wrote two medical compendia in Syriac, the shorter of which was translated anonymously into Arabic, and thence into Latin by Gerard of Cremona. This thirteenth-century translator should not be confused with the twelfth-century translator of Aristotle, also named Gerard of Cremona. Serapion’s treatise comprises seven separate tractates dealing with diseases of the body and nerves; eye, mouth, lung, breast and heart; stomach, intestines, and those caused by worms; liver, spleen, kidneys, bladder, and gout; skin diseases, wounds caused by a bite, and gynaecological maladies; fever; and composite medicines. Our bifolium contains part of the fourth tractate, concerning the kidneys and bladder, particularly kidney stones and the methods of extraction. Contents: The text has no modern edition, so I cite it from the 1525 Lyon printing (Practica Ioh. Serapionis), online at this link: Tractatus IV: De egritudinibus renum et vesice: fol. 37v, col. a … fol. 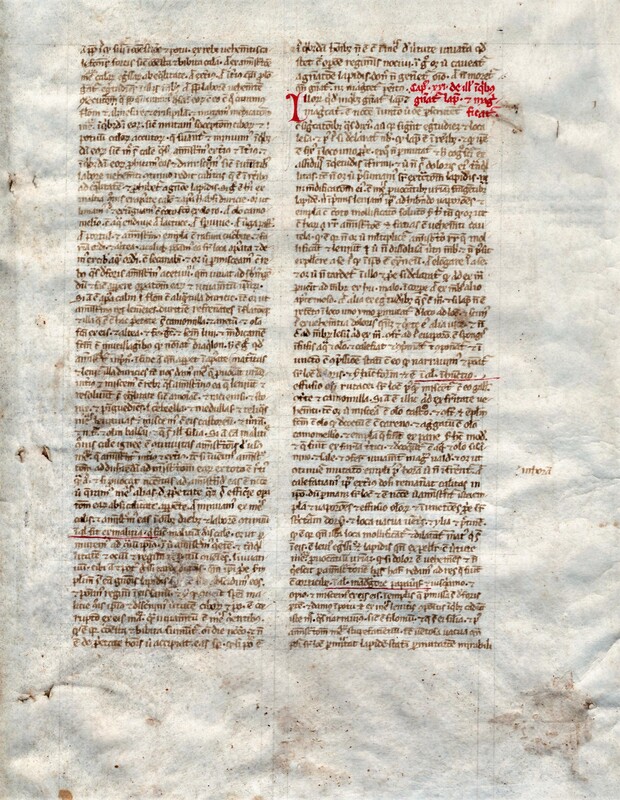 38v, col. a; Tractatus IV: De egritudinibus renum et vesice: fol. 42r, col. a … fol. 42v, col. b. Provenance: titles on the interior pages of the inverted bifolium show its later reuse in a binding of French accounts dated 1586 for the Hôtel-Dieu de Beaufort-en-Vallée (Anjou). The parent manuscript of our fragment was doubtless used at this famous hôpital. On its history, see Jh.-R. Denais, L’histoire de l’Hôtel-Dieu de Beaufort-en-Vallée (1412-1810) (Paris, 1871). Condition: with all the usual defects from being used as a cover (toning, scuffing, spots, stains, etc., but entirely legible. While the outermost corners are cut away, the margins are quite wide. A handsome survivor of a rare text with an excellent provenance.